Like most of Joe Donnelly’s books, Shrike is set in Scotland. The story begins with a seance. It goes wrong and something evil is unleashed in the town of Levenford. Something that likes dark, high places and has claws and teeth. This unfortunate incident paves the way for the introduction of the main character, policeman Jack Fallon. Jack is given the task of heading the investigation into the death of the old woman who chaired the séance and the crime scene provides him with more questions than answers. Jack’s next case is just as perplexing—the disappearance of a baby from its pram. Then more children go missing and, on top of that, Jack has to also investigate a sudden string of murders and suicides. All work and no play might make Jack a dull boy, but in a situation like this what else can he do? He works around the clock. The killer might like high places, but Jack does not. He hates heights and I was filled with admiration for the way he plodded on onwards and upwards whenever he needed to do so and did not let his fear control him. I am not a lover of heights myself and the book contains a few scenes that I found quite uncomfortable to read because they scared me so much. All of these scenes involved a tall chimney and they were very descriptive and well written. As I read the words I almost felt like I was the one climbing up to the top of the chimney and it’s the first time I’ve felt dizzy just from reading a book. 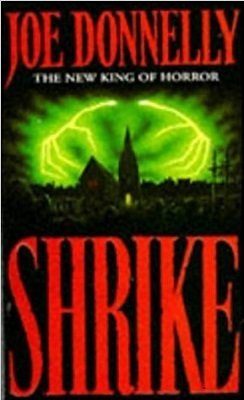 In fact, I have watched movies about mountain climbers and berserk roller coasters and never once felt the terror that I felt when reading Shrike. As you can probably tell, the ‘high points’ of Shrike succeeded in making a big impression on me, but a few chapters failed to hold my attention and my mind started to wander. Jack is an interesting main character, who lost his wife and their daughter in an accident and is still trying to come to terms with his loss. His usual way of doing this is throwing himself into his work so that he is too busy to think about the accident, but he also has a great love for his sister and young nephew who, between them, seem to have helped him through the worst of it. Jack isn’t the only interesting character in Shrike. There are plenty of others. Young librarian, Lorna Breck, is one of them. Lorna is new to Levenford and, although she has always been a little psychic, her gift becomes an overpowering nightmare when she is forced to witness, in her mind’s eye, the terrible atrocities that are happening in the town. Whenever I write a book review I often mention which guy or gal in the story I loved to hate. In Shrike that person is one of Jack’s superiors, Ronald Cowie. He’s a knob, but not the kind of knob anyone would want to affix to a door. He is the kind of knob who seems preordained to have his head put through a door by someone he’s upset. He makes Jack’s life hard at every opportunity and would have made a better politician than policeman. I enjoyed reading Shrike, but I think that I might have enjoyed it even more if it the story had been condensed a bit to quicken the pace. Other than that, there’s not a lot of nitpicking to do.